If a suspect leaves DNA behind at a crime scene, there's now a way to generate a sketch based entirely on a person's genetic code. Here's how it used to work: DNA found at a crime scene would be collected and then compared to a database. It was really only helpful if it happened to match an existing criminal profile. But now a new technology could help solve cases that have been "cold" for decades. In December, a company in Virginia called Parabon began offering a new way to use DNA from crime scenes to generate a composite sketch and give police another tool in their hunt for suspects. The company created a reference database of genomic data and the outward physical traits typically associated with those genes. Now, with each new sample, a mathematical model helps predict which traits that person has, based on their genetic code. "A sketch artist uses information pulled from an eye witness to create a sketch. 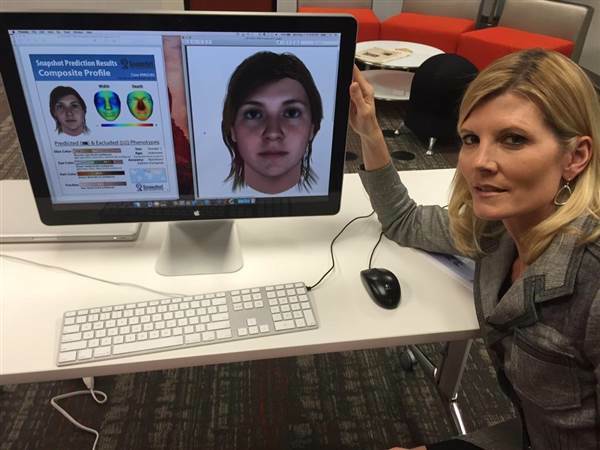 And our algorithms are doing the same thing with a genetic witness, with that DNA that was left at the crime scene to create a sketch," said Parabon founder and CEO Steven Armentrout. For Janet Tinsley, it could be the break her family has been waiting for. Her daughter, April, was abducted from their neighborhood in Fort Wayne, Indiana, when she was just 8 years old. Her killer was never apprehended. "Oh, it weighs on your heart and your thoughts real heavy," Janet Tinsley said. "You're thinking every day — it's like, 'Who can it be?'" Janet Tinsley's daughter, April, was abducted from their neighborhood in Fort Wayne, Indiana, when she was just eight years old. Her killer was never apprehended. 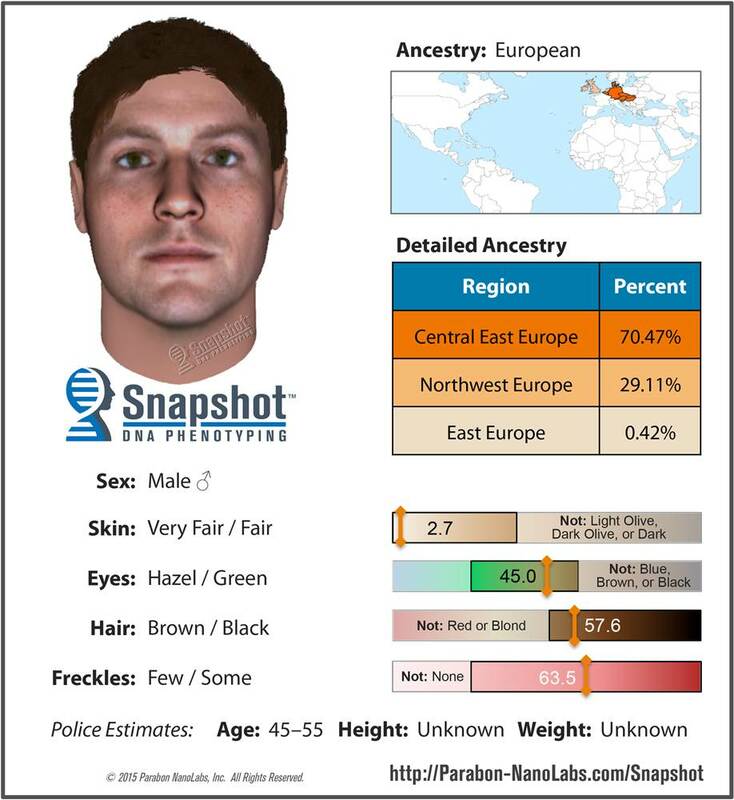 This is a computer-generated sketch of what he could look like based on his DNA profile. 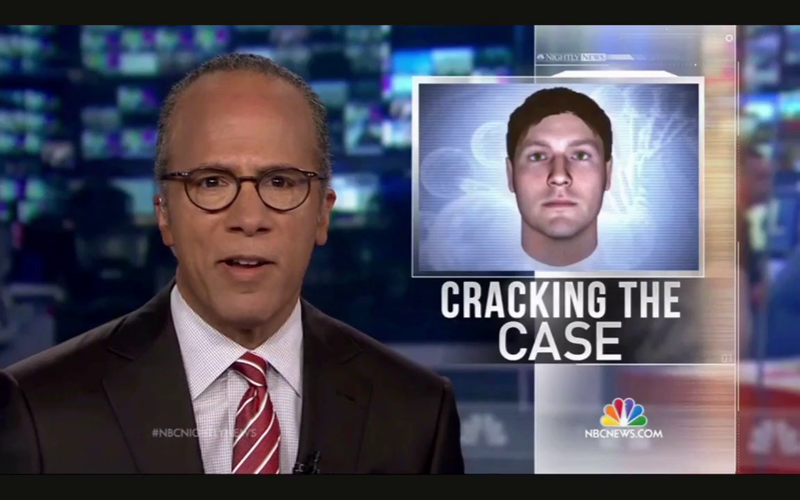 A new composite in the Tinsley case, created with DNA collected at the crime scene and seen for the first time on NBC Nightly News, shows a fair-skinned man with hazel or green eyes and brown or black hair, of European ancestry. "Physical traits like eye color and hair color all of that is written in the DNA," said Ellen McRae Greytak, director of bioinformatics of Parabon. "And we're using DNA like a blueprint to find that information and predict it." The composite profiles created include everything from skin tone to eye and hair color. The level of freckling is predicted as well as gender. And Snapshot predicts the person's ancestry. We wanted to test the technology ourselves so we sent a water bottle to Parabon with my DNA on it. Parabon's lab did not know whose DNA was on the bottle. The composite profile predicted that the person's skin was very fair or fair (with 97.6 percent confidence) with few freckles. Eye color was 97.8 percent certainly brown or hazel. And my heritage? Accurately predicted as English and Eastern European (German). Colleagues say the sketch itself doesn't look much like me, but that's probably because I color my naturally brown hair (there's nothing like being outed by a computer). But there are limits to the technology. Age and height are impossible to predict at this time. And forecasting the shape of someone's face is tough. Still, police say a composite, however imperfect, gives them a way to eliminate anyone who falls outside the prediction. "We've got 800-and-some tips, and over 600 suspects. It'll be easier with this to prioritize which ones we want to work on at this point," said Fort Wayne police Detective Cary Young who's been working on April Tinsley's case. April's mother hopes the technology will make a difference. "I hope it does generate something, because we need all the help we can get," she said. More information can be found at http://Parabon-Nanolabs.com/Snapshot or by calling (703) 689-9689 x251. Parabon NanoLabs is a vertically integrated DNA technology company that develops next-generation forensic and therapeutic products, which leverage the enormous power of DNA. Staffed by a uniquely qualified team of scientists and technologists, with expertise ranging from bioinformatics and chemistry to computer science and pharmacology, Parabon is bringing to market revolutionary new products and services made possible by recent advances in DNA sequencing, analysis and manufacturing technologies. Based in Reston, Virginia, Parabon is privately held and has received mentoring and investment support from the Center for Innovative Technology, an economic development center that assists innovative technology companies in Virginia.